I love your big pincushion and my favorite is the jelly roll and also love the fat quarters...hard to decide. 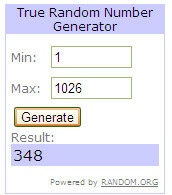 Thanks for a chance to win some Moda fun. You DO know that "one is the loneliest number," right? Okay, one comment, one precut, and one project, not necessarily in that order. I think your giant pincushions are cool. My favorite precuts are charm packs--I know it's rather frugal of me, but I think they're fun to play with. I love the fabrics you used in cushion couture but my favourite is the giant pincushion. Right now my favourite precut is the charm squares - cause they are the right size for many things. My favourite reciopie of yours is the Life Cycle Quilt - what a wonderful idea for a keepsake for baby. My favorite precut are fat quarters they are real stashbuilders for me! Not too much and not to little! My favorite tutorial by you in the bake shop is the Couture Cushions - they are in my plans! Hugs from a big fan of yours in Norway! i love charm packs cause they're cheap & quick! :)i have a layer cake on my birthday wish list tho. i think your play quilt is just darling! Charm packs are my favorite. I like how affordable they are... even when I'm nearly broke I can get 42 different fabrics for less than $10! My favorite project of yours is the essence turnover topper. I think it's the ric rac that does it for me! Fatquarter bundles are great to work with, adding from my stash makes even more options. I'm into making pillows now also so your cushion couture is my favorite right now! 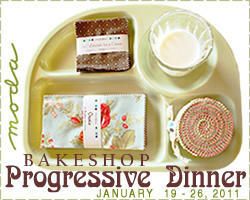 I was going to say the flower table runner, but that sweet baby makes me love the life cycles quilt. 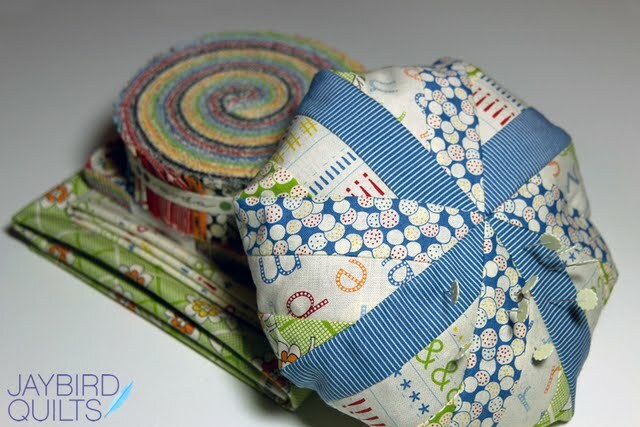 I'm a big fan of fq bundles, but I'm beginning to use the jelly rolls so we'll see how that goes. I really like the life cycles quilt. I just threw a baby shower that this would've been perfect for. Hopefully I can get it done in time to take it to the hospital. My favorite precut would have to be the layer cake...because you can cut it and make four charm packs ;) But I do agree with you, those honey buns are yummy too! I really like your giant pincushion pattern, i would never run out of "pin room" :) Hope you are recovering from all your snow and enjoying some down time. Thanks for the giveaway! Favorite precut? I like jelly rolls, but I think I'd like to play with more layer cakes. A lot of patterns have larger than 2 1/2 pieces. I've only had a chance to use one layer cake, and I really liked it. 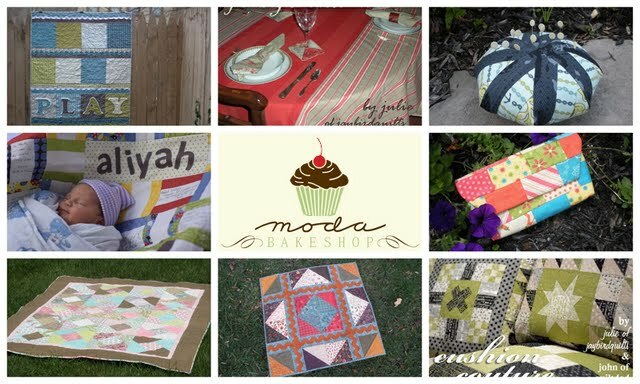 Your Moda Bake Shop Cushion Couture was very cute. I always have a ton of hsts left over from trimming big blocks, and the star/hst pillow is a great idea to use them up. My favorite precut is the charm pack. I'm a very new quilter and I find that I like cutting smaller sized things and the charm packs are perfect for me right now! I love your Essence Turnover Topper... I love the ric-rac on there! Thank you for this wonderful giveaway! My favorite quilt is the Play Quilt. As for my favorite precut I would have to say it's the layer cake. All things cake are good! My favorite precut is the layer cake. I loved your Circles (Dots?) pattern that alternates solid layercakes with printed ones. I made a nice one that combined Fandango with white. As for your patterns on MBS, I think I like the "Play" one the best. The ric rac is a nice detail and I love the colors. I love your The Candy Box quilt!! It is so adorable! I am a new quilter and am working on my first quilt. I would say that I can see posiblities in Layer Cakes, but Fat Quarters seem like endless possibilities... so that would be my favorite. So excited for the book to come out!! 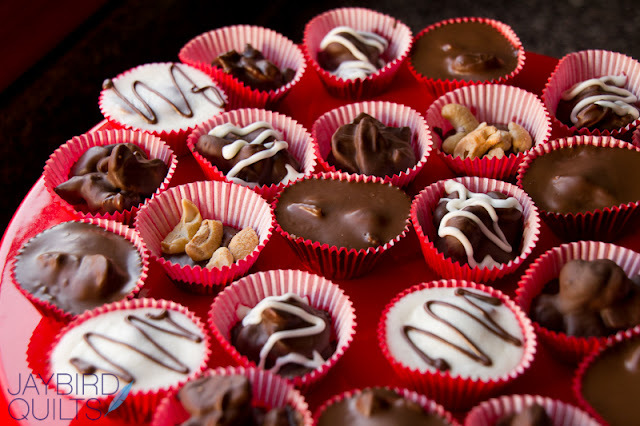 I am addicted to charm packs even though I think that Layer Cakes offer the most flexibility! Hmmmm, I think the couture pillows are my favorite at the moment....but the baby quilt is sooo adorable! I'm a huge fan of the fat quarter bundles because there's so much versatility for creativity - wow that Dr. Seuss sentence was not planned. I truly love your giant pincushion project. What seamstress couldn't use more space for all of her straight pins? My favorite pre-cut is the Fat Quarter bundle but my budget is more partial to the charm packs. My favorite project of yours is the essence turnover topper quilt as I love me some jumbo ric-rac. PS - I left a comment on Tues or Wed and followed all of the instructions but I don't see it here & since you said all comments had been added I am trying again. I hope that is ok.
Congratulations on the book! My current favorite precut is layer cakes, and my favorite of your MBS projects is the Life Cycles Quilt. I love the charm packs. Nice size to have a little for the collection and a cute little project. I love the pincushion. Congrats on the book. I love layer cakes. The possibilities just seem so endless! I've had the Play School quilt on my enormous list of "Things To Make" forever! I think it's my favorite of your MBS projects. 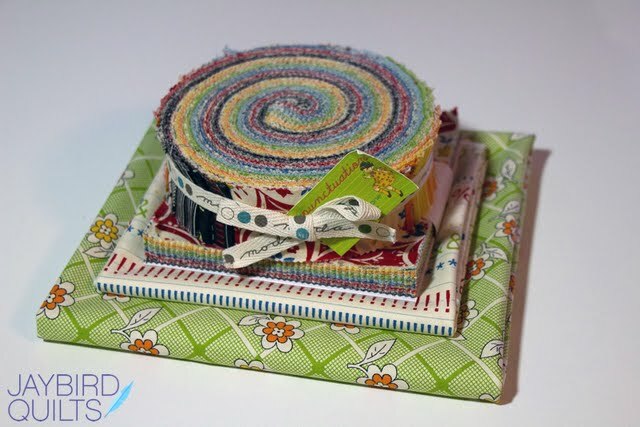 I love Jelly rolls, I make a lot of different things with a good jelly roll. Plus I have been known to enjoy a layer cake now and agian! My favorite project of yours would have to be your life cycles quilt. I loved the personal touch. 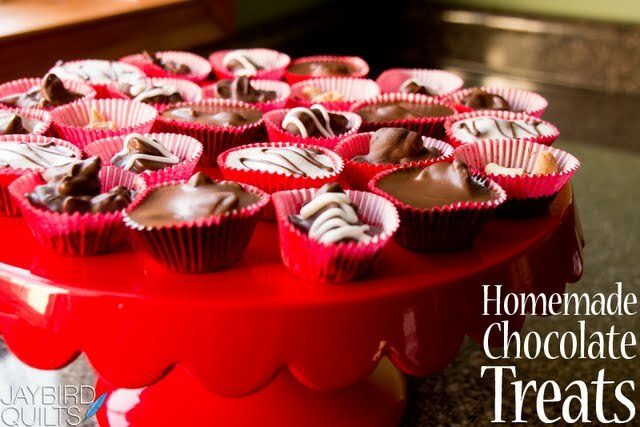 My fav precut are def fat quarter bundles and next, layer cakes. 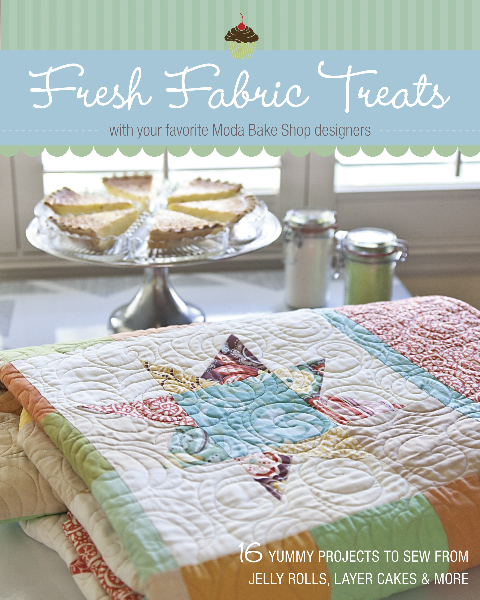 My fav project of yours - the Candy Box quilt but I love those Couture Cushions too ! Right now I am loving jelly rolls but charms will take over once again, I'm certain. And..... the pincushion. Love your blog! Love it! !